Osvaldo Quiroz-Lopez is accused of shoving a 2-year-old after the child's mother refused to tip Quiroz-Lopez. 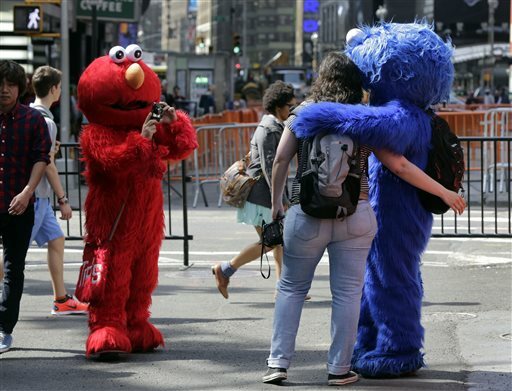 NEW YORK — A man who dresses up as Cookie Monster in Times Square turned down a plea deal in a New York City case accusing him of shoving a 2-year-old after the child’s mother refused to tip the man. Osvaldo Quiroz-Lopez is charged with endangering the welfare of a child. The Daily News says the plea deal would have let him off with two years of anger management counseling and two days of community service. Quiroz-Lopez turned down the offer Wednesday after prosecutors said he would have to plead guilty to the charge. He was arrested April 7. Police say he demanded $2 from a Connecticut family that posed with him for a photo. According to a criminal complaint, he shoved the toddler and yelled obscenities at the family.